- Are bullet-trains coming to America? If we can find ways to privately fund their construction, then I hope so. Lengthy article about the potential of high-speed railways in the U.S.
- Speaking of funding, I loathe taxes. To me, taxes = freedom. The more money you have, the more freedom you have. There aren't many things I am willing to spend taxes on. I am more than willing to throw my hard-earned money into space exploration. Lord knows I am no greenie, conservationist or progressive, but some day in the future we are going to run out of resources or real-estate. It may happen 300 years from now or 10,000 years from now, but it will happen. The sooner we start working towards permanently getting off this crazy blue rock, the better. Unfortunately, Obama is planning to kill the latest manned moon missions. There are many ways to define a movie villain, here is how I define mine...while watching the movie if I was rooting against the character, they are a villain. Using this rule, characters like Michael Corleone, Tyler Durden, etc. cannot be on my favorite movie villains list. In other words, anti-heroes are not villains. Who are your top five villains? Post your top five in the comments section. - Do you own a desktop computer? Do me a favor, please do not upgrade it. Do not buy a new desktop when your old one goes dead. Please do not spend a dime on your desktop ever again! "He's dead, Jim." Nowadays laptops can do everything a desktop can do. Laptops are roughly the same price as desktops and since they are obviously more portable than a desktop, they are much more convenient. I cannot imagine I will ever buy a desktop computer again. 15 inch to 17 inch: These laptops are typically just as fast a desktop computer. They can be a bit bulky and heavy. If you are seriously into gaming on the go, are far-sighted, or love watching movies on your laptop then a larger laptop may be for you. I shy away from larger laptops because I find them inconvenient to carry. 13 or 14 inch: A few of these laptops are just as powerful as their bigger brothers, but the souped-up 13 or 14 inch laptops often have problems dissipating heat. I can't tell you the amount of time I have spent trying to find the perfect 13 inch gaming laptop. 10 to 12 inch: These laptops are frequently referred to as "netbooks." They are the hottest-selling kind of laptop on the market right now. You can't play games on these (at least, not the newest games), you can't run 30 programs at once and obviously the screen sizes are tiny, but boy are they convenient. I currently own the Lenovo S12 ION netbook. It's a hybrid between a regular laptop and a netbook. It has a gaming video card inside of it, thus giving it cross-over appeal. 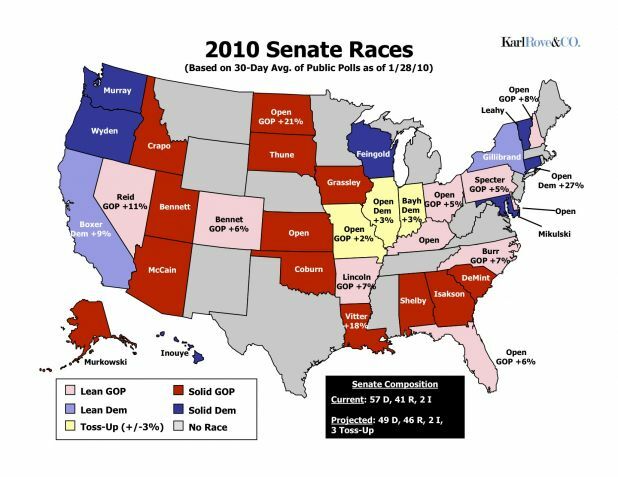 - A map showing the state of each senate race for the 2010 elections. Thanks Mr. Rove! I will let you decide who #5 should be. Please use the comments section to give us your opinion. - "What's next Ridley?" The Right stuff. What will Obama do next, now that Scott Brown has won the senate seat in Massachusetts? Brown's victory last night can only be interpreted one way...as a repudiation of Obama's policies over the past year. If a democrat cannot win in one of the most blue states in the union, imagine how the rest of the electorate feels? Oh sure, Coakley was a lazy campaigner and Brown ran a clever, semi-populist campaign, but Brown pounded Obama and his agenda. Brown didn't necessarily run as a Republican, but he certainly ran as a Tea party conservative, which is close enough. As I stated on my facebook page, tonight's election results are unimpeachable, empirical evidence that in 2008 people voted against George W. Bush and voted for the personality of Barak Obama. They did not vote for Obama's policies. The average American voter cannot stand Obama's policies. The blue-dog democrats in red and purple states must be quaking in their boots after the Brown win. Steam-boat Teddy is spinning in his grave! So, I ask again, what will Obama do now? Bill Clinton faced basically the same decision in 1994, although he was in a much more dire situation. Clinton had just lost the house of representatives and the senate to the republicans during the mid-term elections. Clinton very wisely moved towards the center, made the republicans into the bad-guys and won re-election. Will Obama do the same? Will Obama lurch towards the middle? Will we see Obama the politician or Obama the liberal? My best guess is we will see Obama the politician. I think Obama is truly a liberal at heart, but the only thing better than getting elected president of the United States is being president of the United States. I think he will do almost anything to keep the job, and that includes becoming a moderate for a little while. For the next few weeks Obama will stick to his message, but casually he will let the healthcare bill die a quiet death. I wouldn't be surprised if sometime in March or April Obama pushes for some middle-class tax cuts and maybe asks for even more money to fight the war in Afghanistan. - I have started a list of the political twitter feeds I follow. Good stuff. This list was on fire Tuesday night! - Let's do some politicing. As Pappy O'Daniels would say, "This ain't no one-timin'. We are mass-communicatin'!" Ted Kennedy's seat is up for special election this Tuesday and the most recent polls have the Republican Scott Brown with a small lead. Hmmm...I think my toes feel a little numb because HELL MUST BE FREEZING OVER! A republican may take car-barge Teddy's seat in Massachusetts! Obama is traveling to Boston Sunday to campaign for the democrat. You think getting rejected in Copenhagen during the Olympic selection committee meetings was a slap in the face to Obama, watch what happens if Brown wins that senate seat. - Have you noticed that when you send or receive emails using a web email client, like gmail, hotmail, yahoo, aol, etc., advertisements often will appear to the left or right of your email, or even contained in your email? The email programs crawl your email just before you receive it, and generate ads for your viewing pleasure based upon the content of the email. Besides the obvious privacy issues with letting a company crawl your emails, many web-based email users find the ads annoying and obtrusive. I don't mind the ads; it's the price of using free web-based email clients. Tie: Tommy DeVito, Goodfellas and Sergeant Thomas Highway, Heartbreak Ridge. The are many, many more who deserve to be on this list. Use the comments section to add your favorite foul-mouthed movie characters to the list, but please dont give examples of how foul-mouthed these characters actually are! Let's keep this website PG-rated. I am in favor of the new armor, but I am not floored by it. I like it slightly better than his previous armor. I was hoping his new armor would mimic the movie armor, which I adore. No character in the history of comic books has received more costume changes than Iron Man. Iron Man was created in 1963. 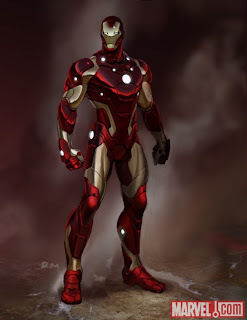 From 1969 till about 1990, Iron Man had the same red and gold armor. Then, Marvel started giving him new armors on a frequent basis. I dont care for the small white lights on the armor, and I wonder why this new armor has the small lights? Perhaps they are landing lights? /sarcasm off. - My first hack for the Google Nexus One phone. This hack actually works for any android OS phone. Cell-phones are notorious for quickly data switching from 3G to Edge and back again, when all you really want is to stay on 3G. If you are using an android phone, open your dialer, type the following into the dialer as if you were placing a call "*#*#4636#*#*" select Phone Information, then select WCDMA only. This will force your android-based phone to only accept 3G connections. - My Nexus One phone arrived today. - Now that I am updating the website more often, the site will probably undergo periodic renovations for the next few weeks as I try to find a layout and color scheme that suits my needs. A few weeks ago I switched to a blue/grey/white color scheme with rounded borders, but that particular scheme makes it very difficult to add or manipulate items on the website. The rounded corners that look so nice on your screen are in fact gif images placed behind the text of the website. Anytime I want to widen, shorten, move, or in any way modify the dimensions of the website, I must make all new border images to match the new layout. Needless to say, this is a serious pain in the buttocks, so I am trying to find a simpler layout that still has a sophisticated look to it. - In conversation, when you mention what year it is, how will you phrase the year? Will you say it is "two thousand and ten", or "two thousand ten" or "twenty ten"? The following website is pushing the public to phrase the new year as "twenty ten" which sounds best to me. Think of it this way...in the year 1910, no one said "One thousand nine-hundred and ten." In the end, I suspect most people will use the phrase "two thousand and ten." - Which could you live without, the internet or cable TV? Five years ago this would have been a difficult choice for me. Now it's easy. I would ditch cable TV. Anything I can watch on cable TV I can find on the internet instead. How about this question: which could you live without, the internet, or your cell-phone? That's a tougher decision. Post your choice and why to the comments section. As of this writing, I cannot honestly decide which I would give up. I can make arguments for both. - In 1975 Bill Gates and his partner Paul Allen wrote the BASIC programming language for the Altair 8080 personal computer. From that point in time and until roughly three years ago, any software with the Microsoft label was generally assumed to be the best money can buy. Those days have disappeared. Windows 7 is the new and best OS, Microsoft Office is still the most popular office suite application and Internet Explorer continues to dominate the web browser market. All three computer programs, along with virtually all other Microsoft products, are dwindling in market share, and for good reason: they may no longer be the best. Companies like Google (especially Google) stole or recruited the cracker-jack programmers from Microsoft. I mention all this because I want you to try OpenOffice or Google Apps. OpenOffice is an application suite, like Microsoft Office, developed by Sun Microsystems, the company that created the Java programming language. OpenOffice does just about everything Microsoft Office does, but it has a simpler design and most importantly, it is completely free. Google Apps is an online office suite. It doesn't have as many bells and whistles as Microsoft Office or OpenOffice, but it's applications (word processor, spreadsheet, etc.) are all online. This means as long as you have internet access, you have a word processor or spreadsheet. All of your files are saved online. Like OpenOffice, Google apps is completely free. You probably wont switch from Microsoft Office, but since both are free, why not give them a try?